If you are importing only one team’s schedule, and you do not want to add the game_sched_id column to your CSV file, this control allows you to specify the schedule to import. Games with an empty game_sched_id field will be imported to the selected schedule. 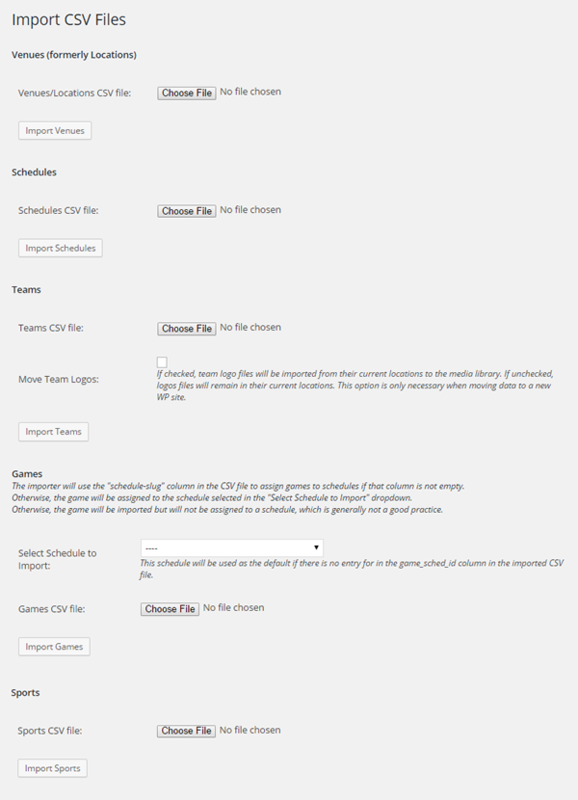 If that column is not in the CSV file at all, all games will be imported to the selected schedule. Creating Slugs. Each CSV file has a has a ‘slug’ column. A post slug is normally the post title, all lower case, with spaces replaced by hyphens and punctuation removed. For example, by default a game titled “Cal vs. Stanford” has a slug of “cal-vs-stanford”. Simple enough, but you can change the slug if you like. The slug column is created automatically in MSTW CSV Exports, but you do not need that column if you are creating a CSV file from another source. The slug will default as described in this paragraph and the next. Unique Slugs. Each slug is unique (to a specific site, not globally). So if you try to add a second game with the title “Cal vs. Stanford”, it will be assigned a slug “cal-vs-stanford-1”, and a third will be “cal-vs-stanford-2”. WordPress will not allow the creation of multiple posts with the same slug. You can’t do it, and you shouldn’t want it to happen. Duplicate Items. If you import data items with the same title field and/or slug field, WordPress will change the slug as described above. All the other data will be unchanged, but now you will have two data items with the same title but different slugs. This may be fine if, for example, one game is basketball and the other is baseball. However, I would recommend using descriptive titles, for example, “2014 Cal-Stanford Basketball” and “2015 Cal-Stanford Baseball”, then you will have an easier time sorting things out on the All Games admin screen. There are a number of ways to organize large numbers of games to simplify sorting and searching. Some are discuss in a video tutorial available to Gold Support members. Note that this behavior also applies to image file names in the Media Library. See the CSV File Formats page for more information. Game Dates & Times. When Games are exported to a CSV file via the MSTW CSV Exporter plugin, the game date & time is exported to the game_unix_dtg column as a UNIX timestamp. This timestamp is not human-readable (although it can be created with a little Excel code). If you are creating a CSV file for games in Excel, say, you can enter the game date and time in the game_dtg column in the following format: 12/7/2014 13:05. If you are using Excel, be sure the game_dtg column with the dates and times in it is formatted as TEXT, NOT GENERAL. If you use General or one of Excel’s Date formats, a number will be saved in the CSV file, NOT the actual string you entered, and the import will not work correctly.